Simulations show North Pacific and North Atlantic subtropical high-pressure systems develop more during spring than summer under future warming. Studies show how subtropical high-pressure systems are enhanced during warmer climate conditions. Enlarge Image. The North Pacific and North Atlantic subtropical highs exert substantial influence on the regional climates over East Asia and North America. Previous studies focusing on the future changes of these two subtropical high-pressure systems during boreal summer did not find consistent changes. Scientists at the U.S. Department of Energy's Pacific Northwest National Laboratory analyzed a series of climate simulations and found that future changes of North Pacific and North Atlantic subtropical highs are much stronger in the spring than in summer. This seasonal dependence is mainly influenced by the Hadley cell, while changes in the temperature contrast between land and sea varied little between the two seasons and contributed little to it. Changes in the seasonal strength of subtropical highs portend associated changes in U.S. regional precipitation. Strengthening of the North Atlantic and North Pacific subtropical highs in spring rather than summer has great implications for the U.S. regional precipitation. As these subtropical highs strengthen in spring under warming, more moisture is transported to the central U.S. by the Great Plains low-level jet, and more moisture is diverted away from the southwestern U.S. The robust enhancement of the low-level jet during spring may provide an important constraint for projecting possible future changes of large storm systems and their attendant extreme precipitation in the central and midwestern U.S.
To investigate the seasonal differences in North Pacific and North Atlantic subtropical highs in a warming world, researchers analyzed 37 climate simulations from the Coupled Model Intercomparison Project phase 5 (CMIP5). They found that these two high pressure systems strengthened more during April–June (spring) than July–September (summer). The seasonal dependence was mainly due to the zonal-mean component, while the zonally asymmetric component contributed more to the spring enhancement. The zonal-mean and zonally asymmetric components are associated with governing Hadley cell circulation and land-sea thermal contrast, respectively. The researchers also analyzed additional climate simulations separating the effects of sea surface temperature warming and the radiative effects of increasing greenhouse gases. 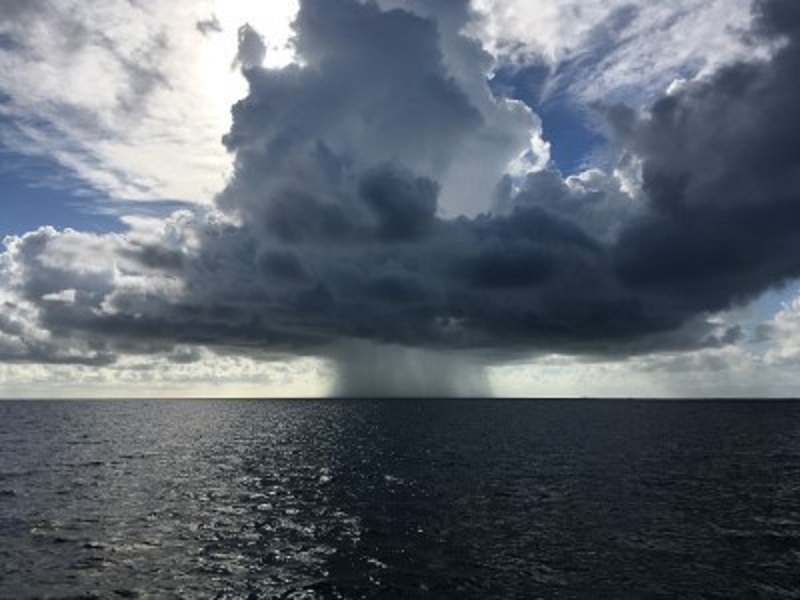 They found that sea surface warming largely drove the seasonal changes in the Hadley cell, while both radiative forcing and sea surface warming led to the enhanced land-sea thermal contrast. Because the North Pacific and North Atlantic subtropical highs are located just west and east of the contiguous U.S., respectively, their robust enhancement during spring has great implications for the U.S. regional climate. During spring, the enhanced Great Plains low-level jet associated with a stronger and northward shift of the North Atlantic subtropical high leads to increased precipitation over the northern Great Plains and northeastern U.S. Meanwhile, a stronger and northward shift of the North Pacific subtropical high leads to increased precipitation over the northwestern U.S, and decreased precipitation over the southwestern U.S.
Sponsors: This research is supported by the U.S. Department of Energy Office of Science Biological and Environmental Research as part of the Regional and Global Climate Modeling program and the Integrated Assessment Research program. Research Team: Fengfei Song, L. Ruby Leung, Jian Lu and Lu Dong, PNNL. Reference: F. Song, L.R. Leung, J. Lu and L. Dong, "Future Changes in Seasonality of the North Pacific and North Atlantic Subtropical Highs." Geophysical Research Letters, 45(21):11,959-11,968 (2018). [DOI: 10.1029/2018GL079940].